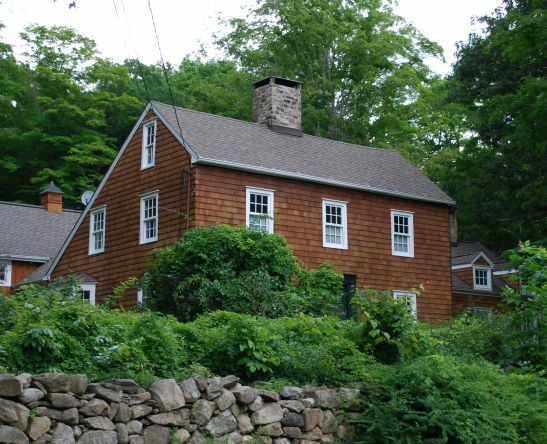 Birthplace of William Henry Hoyt on Benedict Hill Road, New Canaan. 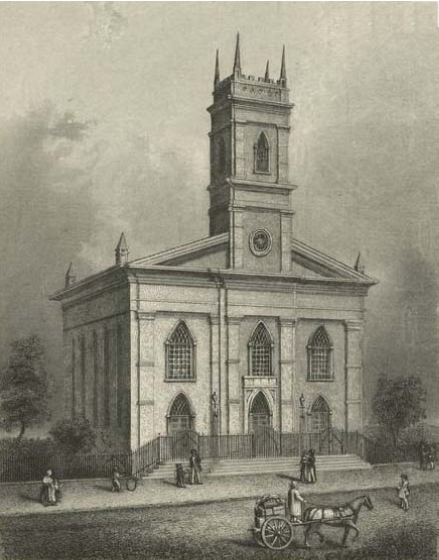 At 26 William married Elizabeth Brady, known as Eliza, at Christ Church in Manhattan. Rev. Thomas Lyell officiated. Eveline, their only child, was born the next year. William is listed as a "painter" at 137 Amity Street (now a playground at West 3rd Street and 6th Avenue) by the time he first appears in New York City directories in 1844. Two years later the family had moved to the Chelsea neighborhood. He is listed at West 26th Street between 8th and 9th Avenues and the street address the following year is 213 West 26th Street. The 1850 census calls him a painter. (2.5) It wasn't until the 1851 directory that his occupation is specified as a coach and carriage painter. an example of a larger New York City coach with elaborate decorative painting. William Hoyt surely did this caliber of work. Evidence elsewhere shows he was more deeply involved in the business as a coach designer and decorator - the latter skill used for ceremonial occasions. The earliest reference found for either occupation was a project involving both in 1847. When the cornerstone was laid for the first Washington Monument in New York City, which was never built, there was a parade and ceremony at the site. (2.75) William devised a display representing "The Temple of Liberty." "This beautiful tribute to the memory of Washington was designed and decorated by William H. Hoyt, and the horses were furnished by Kipp & Brown." The carriage was probably commissioned by someone as yet unknown. There are two images of the carriage that differ somewhat. The second is a portion of a print by the renowned lithographer James Baillie. After you use the above link, you may have a little plus sign in your mouse pointer. If so, the image can be enlarged by clicking your mouse. The woodcut? is accompanied by a description, and says that the draperies were American flags. The print made by Baillie only shows striped fabric below the canopy, but it shows stars on the cap, whereas the engraving doesn't. The latter has a set of bouquet finials on two sets of corners, whereas the print shows them only at the top. Also described were thirteen women holding staffs topped by stars representing the original colonies. This aspect isn't obvious in either depiction. What isn't described are the liberty caps that appear, at least in the engraving. The woman standing has one atop a staff, which is iconic in the history of democracy. The driver is wearing the cap in both images. The engraving shows at least the standing woman wearing a modified American flag design for a dress, which is also not described. The garlands along the base of the carriage are floral in one image and fabric in the other. The print has the eagle on top holding a ring in its beak. The symbolism for this hasn't yet been found. Later evidence shows that William had a direct connection with Kipp & Brown. They were one of the prominent "omnibus" (horse-drawn taxi) firms in New York City. They suffered two fires in the 1840s, both destroying carriages and killing horses. The last and worst was in 1848, which devastated the company. William would have had plenty of work from them in this decade. Another decorative project begs for an image, but nothing has turned up. "N. H. Hoyt" is a mistake. The street address confirms that this was William. No image of this carriage has been found. In May 1851 he was granted a patent for an "omnibus step. "(5) The invention was a simple concept. People getting in and out of horse-drawn taxis (omnibuses) used an exterior step attached in front of the door on the side of the vehicle. William put the step inside the carriage in a sunken well behind the door. This drawing from the patent papers shows a very small taxi as an example. This door faced the rear of the carriage. For the city travel, these stages were superseded by the omnibuses, the first of which appeared in 1830, running from the Bowling Green via Broadway to Bleecker Street; but the drivers were obliging, and if the weather was bad, or there was a lady passenger, the bus would go as far as the Kip mansion between Washington Place and Waverly Place, on the site of the New York Hotel. The buses, at first, were few in number, but were finely painted and decorated, bearing the names of distinguished Americans upon their sides. There were the Lady Washington, the Lady Clinton, the George Washington, the De Witt Clinton, the Benjamin Franklin, and others. Some of the panels with whcih the buses were decorated were true works of art. The buses became popular, and there were soon three lines, run by Brower, Jones, and Colvin; the fare was a shilling (twelve and a half cents), collected by a small boy who stood at the entrance step. The entrance at first was on the side until Kipp & Brown changed it to the rear of the Greenwich buses, and the others followed suit. Omnibus proprietors and builders wishing to apply to their omnibuses Hoyt's Patent Step can make the necessary arrangements by addressing Wm. H. Hoyt, 230 Ninth Avenue. Bodies furnished with the Patent Step attached, and of the best workmanship and sent to any part of the United States. The undersigned stage proprietors are using the Patent Step, and highly recommend them - Kipp & Brown; Ward Boleter & Jackacks; Garrison, Merrian [sic; Merriam] & Brown; Jimmerson & Co.; Joseph Glenat, &c, &c.
When streetcars on rails were invented, the steps were at the front and/or back and led up from the side so that people weren't walking on the tracks. They led up to an open platform with a railing and sheltered simply by an extension of the roof. The design evolution of streetcars and buses saw the gradual enclosing of steps, although some used retractable steps projecting from the vehicle. When motored buses were developed, the open aspect of the steps was completely eliminated by wrapping the entire vehicle into an enclosed space, and this form hasn't changed significantly since. It also brought the configuration back to what William Hoyt had conceived in the first place. Modern buses still use it. 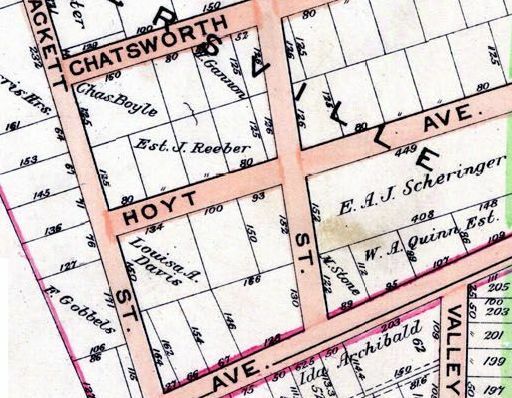 The Hoyts moved to 26th Street about the same time as the disasters at the Kipp & Brown stables and factory. His brother-in-law George Brady, a machinist, was living with the Hoyts in 1850, and may have also been employed by Kipp & Brown. A painter named William Walker and an Irish domestic were also with the Hoyts. The family lived at 230 9th Avenue between 1851 and 1856 and at 207 10th Avenue between 1856 and 1859. By 1857 William ran a grocery and tea business at 453 8th Avenue, but he is also listed in directories as an artist at the same address. The family had moved to 129 West 22nd Street by 1860. William being a designer and painter of coaches suggests several things. His father-in-law, James Brady, had a coach-making business. The most likely scenario is that William was an apprentice at the Brady shop to learn the nuts and bolts of the business and discovered a talent for painting while he was there. This also provides a situation in which he and Eliza met. Kipp & Brown would have provided a much larger opportunity to expand his skills. Petersville was a small development in New Rochelle, New York, which included streets named for William and his brother-in-law James Decker. As late as 1914 there were still no houses built there, just individual lots. The area has since been redeveloped with no trace of the old streets. At some point William extended his art to canvas. He is listed in the exhibition catalogues of the National Academy of Design for 1859 and 1860. (2) He showed three paintings in 1859: "The Bane and the Antidote," which may have been a genre scene, but given his other work, a symbolic still-life; "Melons," with H. J. Concklin listed as the owner, and two called "Fruit," which were still-lifes. In 1860 he showed two other fruit still-lifes. None of the paintings were listed "for sale," which was an option for exhibitors, but aside from "Melons," two fruit still lifes were sold at some point, given that they have appeared recently in the art market. Another still life remains in the family. All may have been among those exhibited. H. J. Concklin hasn't been identified. HOYT - In Newburgh, on Saturday, July 12, William H. Hoyt of the City of NY in the 48th year of his age. Funeral at his residence 129 West 22nd St., Mon. afternoon, 2:00. The Whig Press, published in Middletown, NY, reported his death on 16 July, saying erroneously that he was 48, died on the 13th of July and that he was formerly of New York City. (3) Letters of Administration for his estate say that "immediately prior to his death he was a resident of New York City. "(3.5) New York City kept records of "Bodies in Transit," when bodies were brought into or through the city bounds. William appears there(4) with the cause of death "pthisis," which was another term for tuberculosis. There is nothing found that suggests why William was in Newburgh. Tuberculosis is not a sudden onset disease. Was he there for treatment? There are no official death records for Newburgh from that time. The person responsible for the body "in transit" was the sexton for Calvary Baptist Church on 23rd Street, Manhattan. As was common for church sextons, directories also list him as an undertaker. This may indicate a family affiliation with that church, which was short-lived and for which no records have been found. The "Bodies in Transit" record and a burial certificate at The Evergreens Cemetery say that he was first buried in Green-Wood Cemetery. Evergreens says he was reinterred there on 20 December 1876, the same day his son-in-law was buried there and a day before his wife. Although Elizabeth (Brady) Hoyt's family had a plot at Green-Wood, there is no record of his being buried there, leaving the question of where at Green-Wood he was for all those years. 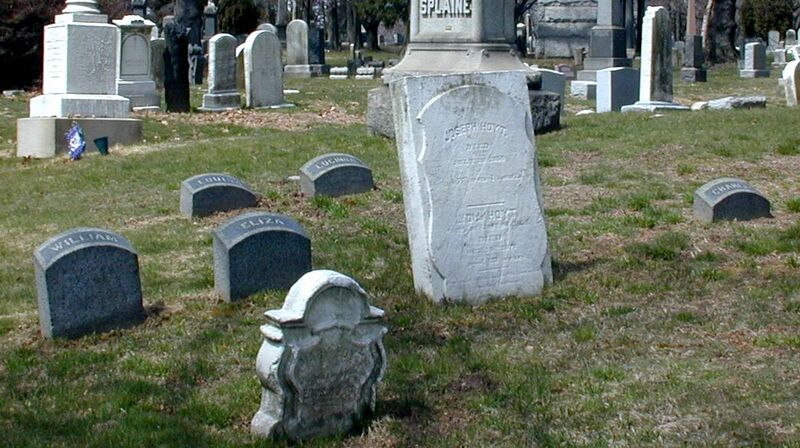 No reason has come to light to explain why William didn't go directly to Evergreens in the plot he purchased for his father's burial in 1856 and which had room for 9 others when William died. Was there a kind of quarantine for tuberculosis deaths? It can be assumed that his daughter Eveline (Hoyt) Ellingwood was in charge of these burials and made the decision to reinter her father and her husband, who had died the previous August and whose whereabouts inbetween isn't known. William's grave and those of most others in the plot are marked by small granite stones giving their first names. These may have been placed by the Ellingwoods when William's sister Louisa was interred there in 1894, as they are typical of that time. Elizabeth, her daughter Eveline and various boarders, including various siblings of Elizabeth's and their families, continued to live on West 22nd Street after William died. Elizabeth apparently kept the tea and grocery store open, given that she is listed with the occupation "dry goods" in the 1870 census. vital records sources: His birth date doesn't appear in New Canaan municipal or church records, but it does appear in private records, which were very likely the source for information on the family in David W. Hoyt's A Genealogical History of the Hoyt, Haight, and Hight Families, etc., (1871). His death date is reported in The New York Times and in "Bodies in Transit" records of the City of New York as well as private records and the Hoyt genealogy. His marriage is found in an announcement in The New York World, 19 Mar 1842. It is confirmed in the David Hoyt genealogy. 1. 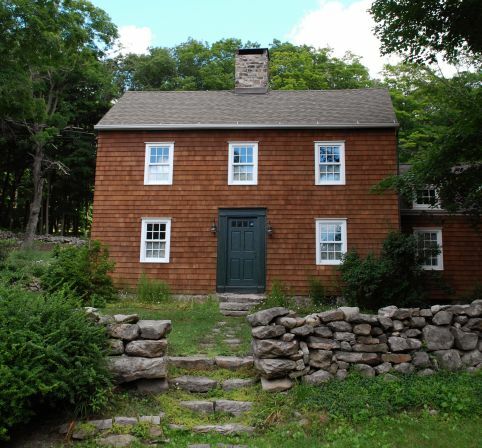 Deed records indicate where they lived in New Canaan and about when they moved, and censuses confirm he was born in CT.
1.5. Stephen Jenkins, The Greatest Street in the World, (New York:1911) pp. 145-146. 2. New York Historical Society Collections, LXXIV (1941), "National Academy of Design Exhibition Record 1826-1860." 1861 and 1862 aren't published as far as I know but should be checked for more entries by William. 2.5. US Census, New York, NY, 16th Ward, District 3, p. 156A. 2.75. New York Herald, 20 Oct 1847. 3. He was in his 48th year, meaning he would be 48 on his next birthday. The Times got it right. 5. 27 May 1851, #8119. 6. The New York carriage makers were John M. Runyon and Joseph Foster. In Philadelphia, Thomas "Deschamp" (sic: Deschamps) testified on behalf of the proprietor "Glendat" (sic: Joseph Glenat and Mary Deschamps Glenat) in Philadelphia. 7. New York Herald, 17 Jan 1852, p. 5.